Is The Ford Mustang SVO About To Make A Comeback? Ford could introduce a new entry-level performance Mustang that revives the SVO name at the 2019 New York Auto Show. This week, we possibly found out the first details about the next-generation Mustang. Allegedly, the next Mustang will switch to Ford’s CD6 rear-wheel-drive platform that underpins the new Explorer and Lincoln Aviator SUVs. As a result, it could be as big as the Dodge Challenger. The current-generation Mustang, on the other hand, isn’t going anywhere for a long time and could remain on sale until at least 2026. A major update will be rolled out in 2021 to keep it fresh, but before then Ford will reportedly expand the Mustang lineup with a new entry-level performance model. According to Motor1, the new Mustang variant will debut at the New York Auto Show this month. Details are scarce, but the new performance model could revive the SVO nameplate. Ford built the Mustang SVO from 1984 to 1986 and fitted it with a turbocharged 2.3-liter four-cylinder that produced 205 horsepower. It was just as powerful as the V8-powered Mustang GT at the time, but the smaller engine made the SVO lighter and more nimble. Ford also fitted it with upgraded suspension and brakes. The entry-level version of the current Mustang is powered by a 2.3-liter turbocharged EcoBoost four-cylinder producing 310 hp. Tuning companies have managed to extract much more power from this engine, so it’s possible that Ford will increase the power in the new Mustang SVO. 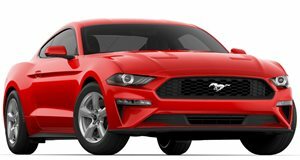 The new variant would slot in neatly between the EcoBoost model and the V8-powered Mustang GT since there is a 125-hp gap between these two models. A new SVO would also likely receive some suspension and chassis upgrades along with some retro-inspired visual modifications such as a hood scoop that pays homage to the original 1980’s Mustang SVO. We won’t have to wait too long to find out if the report is accurate, as the New York Auto Show kicks off on April 17.